Pyrotect Pro Ultra Triflow Helmets are shipped with Top Air, Side Air, Top and side Block Off Plates so you can configure your helmet in multiple ways! The most versatile Pyrotect Helmet Ever! Pyrotect'sA2015 Pro Ultra 100% Carbon Fiber helmets are unmatched by the competition. The Pro Ultra TriFlow SA2015 helmets come with an all new TrueFit unique six pad interior system, which allows for exact sizing of the helmet for a perfect fit, to go along with the all new corrugated ridges to allow for superior heat transfer and airflow to keep you cooler and reduce fogging. The Pro Ultra helmets are vacuum bagged and autoclave cured for superior helmet strength and durability while keeping the helmet as light as possible. Pyrotect's SA2015 Pro Ultra 100% Carbon Fiber helmets are unmatched by the competition. The Pro Ultra TriFlow? SA2015 helmets come with an all new TrueFit? unique six pad interior system, which allows for exact sizing of the helmet for a perfect fit, to go along with the all new corrugated ridges to allow for superior heat transfer and airflow to keep you cooler and reduce fogging. The Pro Ultra helmets are vacuum bagged and autoclave cured for superior helmet strength and durability while keeping the helmet as light as possible. Pyrotect Pro Ultra Triflow? Helmets are shipped with Top Air, Side Air, Top and side Block Off Plates so you can configure your helmet in multiple ways! The most versatile Pyrotect Helmet Ever! 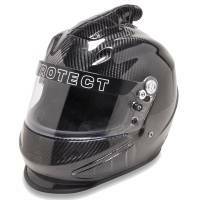 Pit Stop USA offers Pyrotect Pro Ultra Triflow Carbon Duckbill Auto Racing Helmet 4030995, 4031005, 4032005, 4034005, 4035005, 4036005, 4037005 at low everyday prices. Be sure to check out all our products from Pyrotect including Pyrotect'snell SA2015 Rated Auto Racing Helmets.